Modibo Keita was Mali's first President, ruling the nation from 1960 to 1968. Inspired by Guinea's Sékou Touré, his government enacted a radical cultural policy which saw the formation of state-sponsored regional and national orchestras. 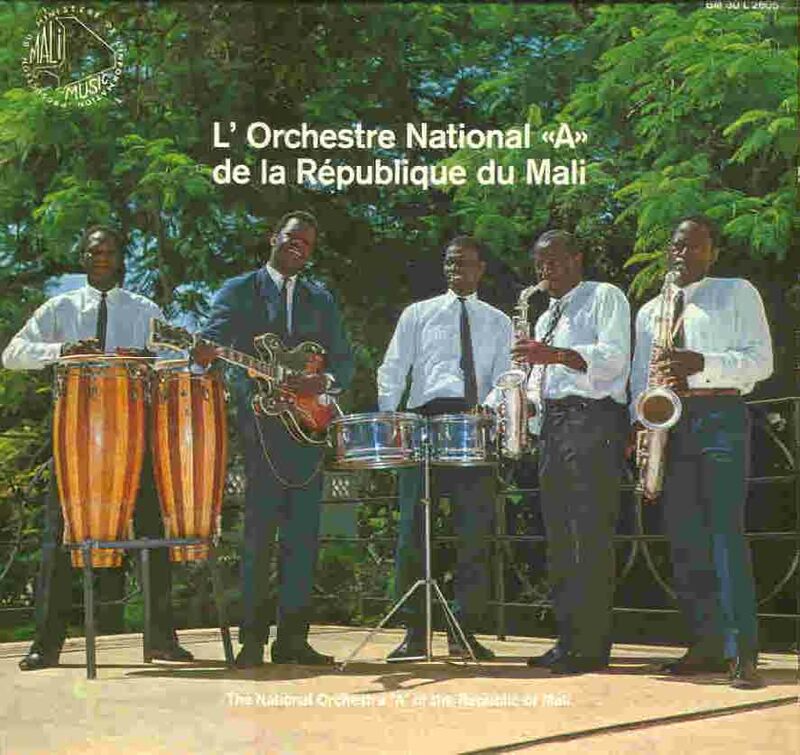 L'Orchestre National "A" de la République du Mali were the first of these bands, and were formed the day after Mali's independence. In accordance with the cultural policies of the new government, the orchestra consisted of "musicians sworn to serve their country by contributing with all their genius to the protection and revalorization of Malian musical art". The orchestra contained some of the best musicians in the land, though not all could fit into one band, hence the existence in later years of the National "B" and "C" orchestras. The National "A" orchestra was led by Keletigui Diabaté, a multi-instrumentalist who played lead guitar in the group. The connection between Guinean and Malian cultural policy is enshrined in the group, for Keletigui was a former member of Guinea's Orchestré de la Garde Républicaine (première formation). The National "A' Orchestra's only LP (pictured above) was released in 1970 on the Bärenreiter-Musicaphon label. It contains two songs from the epic narrative tradition of the griots, "Taara" and "Duga", the latter on par with the best performances recorded in Mali. The exceptional number on the LP, however, is "Janfa", a song concerning a lover's betrayal (also performed by the Tjiwara Band de Kati, among others). It's a superb number with a mesmerizing guitar solo by Keletigui Diabaté, and it was surely an inspiration for many of the nation's musicians. It's criminal that this LP, along with the other Bärenreiter's, has never been re-released. A non-commercially released cassette of the National "B" orchestra survives, the personnel including Kassemady Diabaté on vocals, Madou "Guitare" Sangaré on lead guitar (ex-Kéné Star and Orchestre Régional de Mopti), and Boubacar Diallo on rhythm guitar (National Badema & Oumou Sangaré). The National "C" orchestra, of which no recordings are available, contained Daouda "Flani" Sangaré, Zani Diabaté, and Madou "Guitare" Sangaré. The National A and B orchestras combined to form Orchestre National Badema, who continue to perform today, while the National C orchestra became the Super Djata Band. With thanks to Stefan Werdekker and Daouda "Flani" Sangaré.